The Burlington Royals are set to begin their 2018 season on June 22nd, marking their 33rd consecutive year of Appalachian League baseball in Burlington and 12th as a member of the Kansas City Royals organization. This season's promotional schedule brings back fan-favorite season long promotions like Dollar Monday Madness, Times-News Family Sundays, and Thirsty Thursdays. 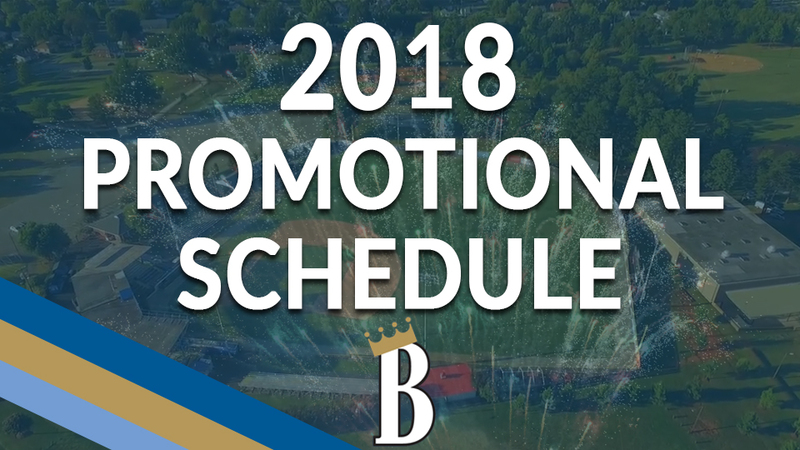 In addition to daily promotions, the B-Royals feature unique giveaways and theme nights throughout the 2018 campaign. The calendar has thirty-five nights of entertainment for all ages, including a tie for our record-high seven fireworks shows, two specialty jerseys, seven Kids Club games, and endless amounts of fun. From Monday through Sunday, you are guaranteed to have a great time at Burlington Athletic Stadium at an affordable price. FANomenal Fireworks Shows: The Royals will again light up the sky on select Saturday Nights during the summer as well as the Independence Day Celebration on July 4th. This season will feature a record-tying seven spectacular shows. Times-News Family Sundays: Be on the lookout for $2 ticket coupons in your Sunday edition of The Times-News. Kids who sign up for Bingo's Kids Club (presented by Pelican's Snoballs) will be able to attend different events each Sunday. Exclusive Kids Club events include a Player Meet and Greet and Family Game Night. Also, kids run the bases following every Sunday home game! Sign up for the Kids Club here. Dollar Monday Madness: The best value in town returns - $1 general admission tickets, hot dogs, soda, water, peanuts, candy and chips. All for just a buck each on all Monday home games. Thirsty ThursdaysTM: The Royals will continue to be the biggest bar in town on Thursday nights. With over 12 beers on draft, enjoy a draft beer for only $1 every Thursday at the ballpark. Burlington baseball is back at the BAS! Come celebrate the 30th anniversary of Bull Durham with appearances from Crash, Annie, and Nuke from the Durham Bulls. Fun fact: Burlington Athletic Stadium made a short cameo in the movie. Can you find where? Male Pattern Baldness Awareness Night - It's time to raise awareness for the men who are suffering from this unfortunate hereditary state. The Royals will have a pre-game bald guy parade, hat specials, and sunscreen for those whose domes are exposed! Burlington Athletic Stadium is the place to be this 4thof July! Celebrate our nation's freedom with bounce houses, games, and more fun activities! Gates will open at 6:00 P.M. and game time is at 7:00 P.M. Stay after the game for a dazzling display of fireworks! An ode to the triad community, Tobacco Road Night is all about the rivalries right down the road from Burlington. Legendary Duke football and basketball broadcaster Bob Harris will be signing books and honored with the ceremonial first pitch. Wear your favorite Tobacco Road School's colors as the Royals will look to settle the debate of which school rules Tobacco Road. But that's not all - in honor of the 25th anniversary of the 1993 Burlington Indians winning the Appalachian League championship, we will have 1993 ticket and concessions prices all night long! The Burlington Royals will also don a specialty Fauxback jersey. Enjoy good food and good brews? Burlington Athletic Stadium will host food trucks and several choices of craft beers in the right field picnic areas! The Royals have teamed up with Alamance County Public Libraries, Sylvan Learning Center of Burlington, and Chick-fil-A to achieve the goal of Alamance County kids reading over One Million Minutes! Kids around the community are invited to read over 360 minutes to earn great prizes. To pick up a form, please visit your local Alamance County Public Library. Ever eat so much that it looks like you're having a baby? On Friday, August 10th the Royals will challenge you to do so! All tickets* to the game come with all you can eat hot dogs, pizza, and chips! *Season Tickets and mini plans will need to upgrade their ticket at the box office for $4 per ticket. February may have marked Burlington's 125th birthday, but that doesn't stop us from celebrating Burlington's 125 and 1/2 birthday at Burlington Athletic Stadium this summer! The Royals will look to commemorate the occasion with a mini cupcake giveaway presented by Main Street Cake, and $1 beers all game long! Come celebrate the town formerly known as Company Shops and show your Burlington pride. Help support the Autism Society of North Carolina by registering for our sixth annual Run/Walk for Autism 5k! Registrants will receive a free pair of socks courtesy of OT Sports and a ticket to the Burlington Royals game that night. All proceeds to go benefit the Autism Society of NC. The race will begin at 8am. Come back to Burlington Athletic Stadium that night and kick back while watching the Royals play the Bristol Pirates. Stay after the game for a thrilling fireworks show! Sunday, July 8 - 2pm start time: Ever seen a flea market at a baseball stadium? That's what our concourse will transform to! Come have a mini yard sale and sell your stuff at Burlington Athletic Stadium. Those interested in a booth can call 336-222-0223 for more information. The Royals also invite ALL little leaguers and their coaches in the community to come enjoy a pregame parade and take advantages of discounted tickets for players and coaches. Wednesday, July 25 - 11am start time: It's our annual Day Game! Bring your friends, kids, or coworkers out for some lunch and a great afternoon at the ballpark! Summer camps, daycares, and kids clubs are all invited for a fun outing with friends. For a full list of promotions, sponsors, and events, follow this link. Standard game time is 7 p.m. Monday through Saturday and 6 p.m. on Sundays, unless otherwise noted. Gates open one hour prior to game time. Season tickets, group outings, and mini-plans are on sale and can be purchased online at or by calling the Royals at 336-222-0223. Single game tickets can be purchased at www.burlingtonroyals.com/tickets.